"The capacity to recover, to adapt to adverse conditions." The city of Statton Crest maintains a semblance of stability despite the existence of people with supernatural powers and an overwhelming swarm of giant bugs that puts life on hold every summer for three months. A man with a growing power has only one desire, to destroy a member of Statton Crest's leadership. Despite his actions promptly leading to his death, he serves to shatter the city's stability. Things break before they can be repaired. Resilience has not been tagged yet. 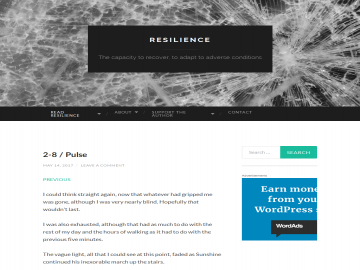 Help others find Resilience by tagging it! Resilience has not been reviewed yet. Resilience has not been recommended yet.